The comprehensive range of measuring instruments and material testing devices that are sold by Bowers Metrology has resulted in the company supplying an extremely diverse range of industries. A recent successful project to provide advanced, ultrasonic thickness equipment to a Northumberland based surface mining operation reflects the varied nature of the industries Bowers now serves.. Approximately one third of the electricity currently generated in the UK is produced by coal fired power stations, as a nation we currently import around 70% of this coal. Whilst the country develops a range of alternative ways to generate power, it is essential that the provision of indigenous coal is maintained, hence the importance of developing new surface coal mines, such as the highly efficient operation managed by The Banks Group in Cramlington, Northumberland. The surface coal mines process involves the exposure and recovery of shallow coal deposits from the ground through the removal of top soil, sub soil and overlying rock by heavy duty excavators and dump trucks. The abrasive nature of the coal and rocks that are handled by The Banks Group’s heavy-duty plant quickly wears away the steel linings of excavators’ buckets and the bodies of dump trucks. To help overcome these problems, the Cramlington facility has a well equipped fabrication shop that is able to replace small to medium areas of steel. Larger worn sections, often measuring more than 6mts sqr, are replaced by subcontract fabricators. Richard Warrior, Banks Group (Technical Support Technician) explained “As it cost so much, in terms of lost production, to have our heavy plant out of commission, we decided to investigate the available accurate, yet robust metal thickness gauges. 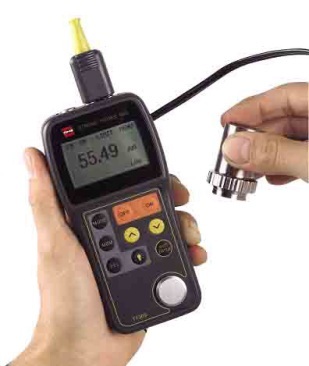 In addition to several alternatives, a web search unearthed the TT-300 ultrasonic thickness gauge. Following a successful demonstration we recently purchased the Bowers gauge. “Now, use of the portable TT-300 allows us to make regular thickness checks on the critical wear areas of our plant and to preempt failure in use. Our new gauge could not be easier to use, by applying the gauge’s transducer probe to the area under investigation and pressing a button, the required thickness reading is captured. As the gauge has a large memory capacity and an RS 232 output, we are also able to up-date our records and create a history that should allow us to increase fabrication service intervals and better target early intervention. “Following the completion of major re-fabrication jobs by external contractors to ensure that the correct thickness of steel has been used, we use the TT-300 to check this work. In this situation we also use a Bowers hardness tester to ensure that the correct grade of steel has been used. Ideal for the accurate thickness measurement of a wide range of materials, the advanced TT-300 ultrasonic gauge consists of a robust, hand-held unit with a compact 5 MHZ transducer probe that is able to be conveniently applied to difficult to access features. An easy to read digital display and a simple keypad gives access to the portable instruments’ measuring facilities, including mm/inch conversion, a min mode for minimum thickness measurement, automatic zero and calibration settings. The cost effective instrument has an impressive internal memory that is capable of storing up to 500 individual readings, whilst the gauges’ RS 232 output is able to download all measured results to data-collection equipment, computers and printers. For more information about the TT-300, click here.